What Tax Deductions Have to do with Your PB and J? 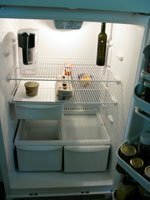 I’ve just returned from out of town and my refrigerator looks “empty.” It’s got a door full of condiments and a random assortment of possibly (probably) expired salad dressings that I don’t really ever use anymore but haven’t thrown out yet. Otherwise, it’s devoid of any real food. you know it hours have past. Now it’s too late to go get lunch so you decide to make a PBJ since it’s the only thing you can cobble together without leaving the house. Ahhh, the joys of working from home! While there may be some nutritional drawbacks to working from home, it does have tax advantages. But like those ignored salad dressings in my refrigerator, many of you who work from home don’t use them because they seem like too much of a hassle. An estimated 52 percent of small businesses are home-based, and many of us have home office space that would qualify for a home office tax deduction. As technology improves, more businesses – large and small – are going virtual and recruiting employees from across the country, many of whom work from home offices. Home offices are here to stay. So why don’t more business owners take the home office deduction? Internal Revenue Service (IRS) just announced that a new simpler option for calculating your home office tax deduction. on up to 300 square feet, for as much as $1,500 in deductions. To take the deduction you must use your home office regularly and exclusively for business, and the limit on the amount of the deduction is tied to income derived from the particular business. The IRS estimates we taxpayers will save more than 1.6 million hours per year in tax preparation time from this simpler calculation method. The new option for the home office deduction will be available starting with the Tax Year 2013 return, which most taxpayers file early in 2014.